The Inter-Pro contest between the Northern Knights and the North West Warriors remains delicately poised heading into the final day at Eglinton. At stumps on Wednesday, the Knights were 152-5 in their second innings and needing 117 more runs to win. Just before the close, Knights substitute batsmen Nikolai Smith was out for 46 in what could prove to be a crucial wicket. Earlier, the Warriors were all-out for 250 in their second innings. 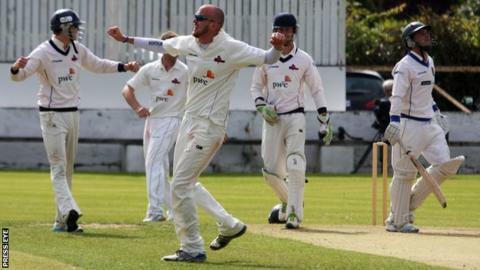 After the Warriors resumed on 38-3, Irish internationals Stuart Thompson  and Andrew McBrine  added 76 for the sixth wicket. However before both fell in quick succession to impressive North Down left-arm spinner James Cameron-Dow who took 7-107 in the innings, to take his overall match total to 10-156. Johnny Thompson  and Ricky-Lee Dougherty  mixed resilience with the occasional thumping boundary as they shared a valuable 8th wicket stand of 87 to take the Warriors total up to 250. The Knights chase started in positive fashion, with Nick Larkin  and Johnny Terrett  striking 12 boundaries between them in an opening stand of 56. Larkin will be disappointed at his dismissal, charging Ernest Kemm only to be well stumped by Dougherty. McBrine [2-22] trapped Chris Dougherty lbw, while he also accounted for Terrett - sharply caught at first slip by Kemm. Andrew White  was well caught behind by Dougherty off debutant Ross Allen, but Smith and teenager James McCollum blunted the Warriors attack in a solid stand of 46, before Smith departed just four minutes before the close of play.